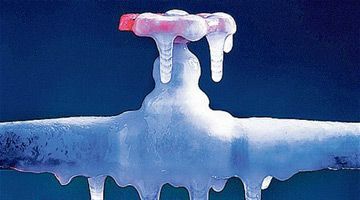 Being prepared and informed may enable you to avoid the messy and generally pricey problem of frozen pipes in Dallas. Water has a special property because it stretches as it freezes. This growth puts tremendous stress on whatever is containing it, including metal or plastic materials. Regardless of the “strength” of a container, expanding water can cause pipes to break. Pipes that freeze most frequently are those who are subjected to extreme cold, like outdoor hose bibs, pool supply lines, sprinkler lines, and water supply pipes in unheated interior areas like basements and crawl spaces, attics, garages, or kitchen cabinets. Pipes that run against exterior walls which have minimum insulation are also subject to freezing. Ensure that garage doors are closed if there are water-supply lines within the garage. Open kitchen and bathroom cupboard doors to allow warmer air to circulate around plumbing. Make sure you move any dangerous cleaners and household chemicals up out of the range of children. Let the cold water drip from the faucet that are used by exposed pipes, when the weather is quite cold outside. Running water via the pipe – even at a drip – helps prevent pipes from freezing. Keep the thermostat set to the same temperature both during the daytime and through the evening. If you will be going away during cold weather, leave the heat on in your home, set to a temperature no lower than 55° F.